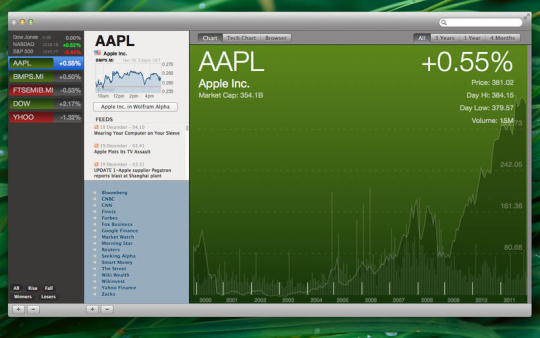 Keep track of shares and stock indices in order to have a real-time interactive panorama of financial markets. Stocks is an application that allows one to keep track of shares and stock indices in order to have a real-time interactive panorama of financial markets.LiveYou may easily add the indices and shares that you would like to follow; the application will continually keep you informed via Rss:On the news regarding these shares, by subscribing to the financial news services in real timeAuthoritative links:Providing a series of quick links to the most authoritative sources of financial information.ChartingA series of very smart graphs will allow you to consult the history of actions in great detail.Overview Chart:Stocks first of all consists of a series of eye-catching graphs that provide information regarding stock exchange prices in time, allowing you to look at a particular period in time.Technical Chart:Besides providing you with an overview, Stocks also provides you with more detailed graphs containing a series of technical data that provide you with a clear picture of the stocks and values that have been purchased in time.NotificationsMenuBar:All shares can be viewed in the Menu Bar, allowing quick consultation of prices without interrupting ones work.Growl:Stocks provides growl notifications; a short message will appear on the desktop upon arrival of financial news.Filters and ViewsThere are various ways of filtering data, both the data provided in graphs and the information regarding the real-time stock prices. This is meant to immediately make clear to users, which shares are going well or, not well. 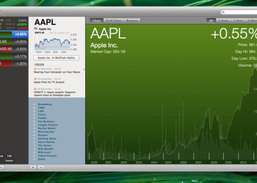 In addition, different colors are used to analogically and quickly show the share's performance.WARNINGStocks is a computer searching application and must not be used as a technical analysis instrument or for tracing the value of ones portfolio. Carefully ready the background information prior to purchasing. Track inventory balance at any time. Study comprehensive financial data and market insights from the markets worldwide. Record, organize and generate Patient charts in the hospital or private office setting.